I am grateful to Data from A Vision of Britain through Time, (c) University of Portsmouth 2004-8 for permission to reproduce the following data and explanatory text. You can access their homepage and Uttlesford page on the following links www.visionofbritain.org.uk. I am also grateful to UK Statistics Authority for permission to reproduce material from their website at www.statisticsauthority.gov.uk or www.statistics.gov.uk. Crown Copyright material is reproduced with the permission of the Controller, Office of Public Sector Information (OPSI). In this article, ‘national’ means England and Wales only. This material has been largely gleaned from census data so only represents what contributors said on a particular day of a year in a number of 10 - year cycles. The earliest census returns were not completed by each inhabitant but compiled by the village priest. Although there are errors in the names, errors in numbers must surely be slight. Consequently the data goes a long way to explaining why we think Uttlesford was, is and will hopefully remain a wonderful area in which to live, work and play. However the data does carry a health warning. It presages the consequences of ignoring the finite resource of space when being overwhelmed by an unregulated population. Before the weight of concrete, tarmac and people cause southern England to slide into the sea, content yourself that you have been fortunate to live in an area which has been bypassed by history and industrialisation and remained relatively unthreatened for hundreds of years - until very recently. Recent comparative data with the national picture corroborates the priorities many of us wrote on our ’shopping list’ when we planned that crucial house-move. The historical data explains how Uttlesford developed, and highlights the impact of major advents such as the railway and M11 motorway construction. The earliest accurate record we have of the Uttlesford population is in the 1801 census when it was 32,054. This figure then peaked across almost every parish between 1841 until 1871. By 1851 it had climbed to 47,000, probably due to the influx of workmen involved in the construction and maintenance of the new railways. There is a distinct peak in most parishes between 1841 to 1871 then they all fall back although not to quite the low point they were at earlier. I had expected to have seen a clear ‘corridor’ of population increase on the western edge of Uttlesford, following the main railway line north to Cambridge but there’s no evidence for this. Maybe for every incomer there was a local seeking their future closer to London or emigrating. It wouldn’t be until 1941 that the population revived. Although Uttlesford’s total population had recovered by 2001, having risen to 68,940, quite a few parishes (some of the Rodings, Rickling, Chickney etc) continued to decline. 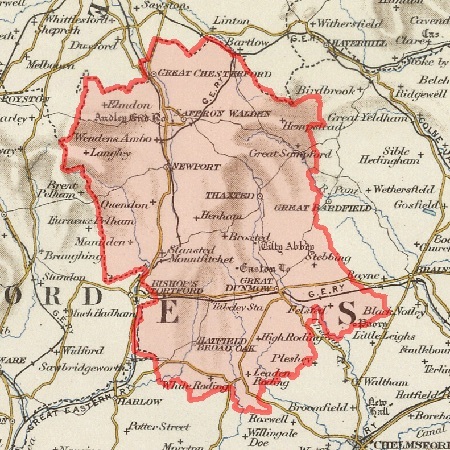 Although the national population in 1801 had increased more than six-fold by 2001, Uttlesford’s 1991 population of 65,432 had only doubled in 190 years. In 1991 those 65,432 people were living in an area of 64,119 hectares (a hectare is equivalent to 2.471 acres). So a density of almost 1 to 1, the lowest in Essex, when the county average was 4.2 and the national was 3.5 people per hectare. At No. 2 was Maldon with 1.5 . By comparison, in 1991 Harlow had a density of 24.8 people to a hectare and Southend was bottom of the pile in Essex at 38. Although many of our villages are worthy of being on a chocolate box cover, don’t be misled. It is these two strands of population and density that are the foundation of Uttlesford’s attraction. But they only tell part of the story. For example the 1991 Census shows that in the age group 18 - 29 yrs of the resident population, whilst Essex had an average of 17.5%, Uttlesford could only manage 15.8%. This suggests that young couples can only stay in, or move into Uttlesford after their crampons are fairly secure on that greasy pole of economic success. We all need an incentive to advance and Uttlesford reflects what such attainment can bring. There are many places in the world where population and density remain relatively constant to each other. In some of them, the density may remain almost fixed (save for erosion or floods), whilst a high birth rate conceals the true consequences of high infant mortality. Sequential census returns and related statistical records demonstrate the high quality of life here in Uttlesford. A graph of population rate-of-change shows that we shadowed the national rate and remained clearly below it until a dramatic shift in 1950. From 1930, with a rate of change of only -2.5%, we had rocketed up to + 12.5% by 1960. Whilst it doesn’t take a huge migration to create this swing on a relatively small population, clearly Uttlesford experienced a profound change in the ‘boom and ‘bust’ / ‘you’ve never had it so good’ days of the late 1950s/early 60s. The -2.5% shows migration away from Uttlesford, followed by the + 12.5% inward migration that marks the beginning of an unrelenting surge to this day. It has taken until late 2008 for the introduction of a points-based system to curb rampant immigration. Even Former Archbishop of Canterbury, Lord Carey said on 11th Sept 2008 that the ‘œglue that binds our society together is weakening’ and called for a cap on immigration. Communities can accommodate this rate of inward migration for a while if it is accompanied by real economic growth. Problems start when a rise in population attracted by that growth impacts sharply upon the density figure. Just the sort of problem that a sudden ‘new town’ can create or an economic collapse - the two threats Uttlesford has faced in 12 months. The data shows that the age bands within Uttlesford largely mirrored the national trend although there was a slight increase of rate in the ‘workers’ band (those aged 15 - 64 yrs) and a very obvious faster rise in those aged over 65%. Both factors have caused Uttlesford’s earning capacity and real wealth to increase and both were also above the national level. Over-65s are growing in numbers so quickly that they will soon equal the working population. They appear to have been self-sufficient and not dependent upon state support. Their private health plans not impacting upon scarce local resources. In fact we are fortunate to access the immense health facilities of neighbouring Cambridgeshire. The 1831 census shows that we scored below the national average in the category of “employers, capitalists, bankers, professional and other educated men”. We did even worse in the “middling sorts” ranking (farmers “not employing labourers”, as “employed in manufacture, or in making manufacturing machinery”, and as “employed in retail trade, or in handicrafts as masters or workmen”) by only achieving less than half the national average. This was a very wide and uncertain field because it included many skilled manual workers so wasn’t equivalent to our current idea of ‘middle class’. At the bottom were the males aged over 20 who were described either as “labourers”, both agricultural and non-agricultural, or as “servants”. In Uttlesford this amounted to 70% whilst the national figure was 40%. The table of Social Status, based on 1831 occupational statistics is very revealing. Uttlesford had a heirachal pyramid of 1:2:7 (285 at the top, 548 middling sorts and 2,125 labourers & servants at the base). Such a steep pyramid means that Uttlesford was at that time very tightly controlled from the top. To add to the sense of backwardness, there were over 2,000 labourers yet only one person engaged in ‘manufacturing’. Then the dramatic impact of the industrial boom kicked in and began to sweep the old order aside. That controlling grip, peaking at almost double the national figure in 1880, thereafter rapidly fell so that by 1970 ‘management’, at least by title, had risen to about one -third. We’re all familiar with the the boardroom-speak of re-badging job titles to ‘operative’ and then ‘executive’. Once individuals were allowed to record their own family data, they could express their own interpretations and define their social positions. Consequently most of the data for this section is not strictly factual but the result of partiality by the ‘upwardly mobile’, or more accurately, the ‘pretentious’. Evidence of the clear change in ‘class’ in Uttlesford comes in a table of ‘males aged 20+ years’ who have been split into five classes from ‘professional’ down to ‘unskilled manual worker’ for the period 1841-2001. In 1841 the ratios for professionals: managers: semi-skilled & unskilled manual workers was 1:10:46. At the same time, the total figure for clerical workers and skilled manual workers was 5,500. By 1971 that last figure had risen to 6,657.but was to fall back in 2001 to its 1841 total. It is the change of ratios between the classes that hits you. For a start, in 1841 the total of males aged over 21 years of age listed in all social classes was 14,740. By 1971 it had reached 15,950 and climbed to 17,530 in 1981. A 20% rise certainly can’t be dismissed although you need to compare this against the national picture to assess its full significance. But it’s still not a huge difference in totals. So the size of the workforce is incidental. It is the ratios that highlight the change, because by 1971 they had moved to 1:4:4. Professionals increasing seven-fold, managers going up two and a half times but the semi-skilled had halved. The chiefs and managers had mushroomed but many Indians had apparently gone, and in 2001 would only be a third of their original size. What had happened? For a start there had been a national drift away from agriculture to the industrial centres and the major trading towns and cities. Then the coming of the railways enabled residents to commute and for outsiders to relocate into the region. The Northern and Eastern Railway Company (NER) was incorporated in 1836 to build from London to Cambridge. By 1843 they had reached Bishop’s Stortford when they were taken over by The Eastern Counties Railway (ECR). On 1 July 1840 trains began to use the still-unfinished Shoreditch terminus. Amazingly the first section of 16 miles from Shoreditch to Broxbourne was opened on 15 September 1840, got to Harlow by August 1841, and reached Bishop’s Stortford on 16 May 1842. The railway was an immediate success and the following year the proprietors applied to extend the line by 10 miles to Newport. ECR then applied to extend some 46 miles from Newport to Brandon in Suffolk, which was the southern-most point of Norfolk Railway’s simultaneous construction of the main line from Norwich. On 30 July 1845 the section from Bishop’s Stortford to Brandon met with the section from Norwich. The route between London and Norwich via Bishop’s Stortford, Cambridge and Ely was complete. The direct London to Norwich via Cambridge route opened on 30 July 1845. Subsequent electrification of the main railway line from London to Cambridge, accompanied at that time, by relatively low-cost longer-distance season ticket prices, encouraged the exodus from suburbia to the countryside. East-west road routes in Essex have never been good. The construction of the M11 motorway at Redbridge in 1973 and completed at Cambridge in 1980 opened Uttlesford up to the car-owner giving increased opportunities to re-locate to Uttlesford. This then gave faster access to the orbital M25 which fueled the migration and the car, unlike public transportation, also gave 360% mobility to the worker. The more recent related Stansted Airport expansion has given us a major hub for inter-city and national coach services. This integrated transport system has resulted in Uttlesford no longer creating its own wealth from within its borders. Most of those new professionals and managers were earning their money OUTSIDE of Uttlesford. For the first time in its history Uttlesford was being freely chosen as a convenient and attractive area in which to live, make a home, raise a family and to play. So personal choice begins with the arrival of the first train about 150 years ago and it is the exercise of this that keeps Uttlesford at the top of the ‘des-res’ list. Employment-type is an excellent indicator of wealth and education. The data provides information for the period 1841 to 2001 on 6 main categories - agriculture, mining, manufacturing, construction, utilities and services. The number employed rose to just above double from almost 15,000 to over 33,000 with the biggest rise, same as population, in the late 1950s/early 1960s. But the changes in employment were immense. During that same period, agriculture plummeted to a sixth of it size; mining (save for a big blip in 1991 probably due to excavation work involving the M11 and Stansted Airport expansion) was stagnant; manufacturing more than doubled; construction almost quadrupled and services went up five-fold. This is when villagers ceased to navigate by field name. Today only the few farmers can do that. Thatcherism arrived in 1979 and is still with us, spawning ‘white van man’, city spivs and the ‘loadsa money’ culture. The ’services’ figures reflect that ‘white van man’s’ mother, a former maidservant, had been replaced by his shop-assistant wife and their offspring were commuting to ‘financial services’ and ‘call-centre’ jobs. None of them are ‘making’ anything, just money on the back of massive quantities of imported goods and ‘invisible’ financial earnings. Now, in 2008, come reports showing that our national manufacturing capability has shrunk at the fastest rate for 17 years. The ’services’ data is important in pointing out the possible future. Back in 1841 almost as many workers were employed in services as in manufacturing and by 2001, two-thirds of all workers were in the services category. However, in 1841 many men and women were employed as servants, grooms etc, when even the middle classes had live-in servants. The difference lies with their employers. All were working for the UK-based wealth-creating entrepreneurs of the industrial boom when Britain built for the world. Many also worked for the labour-intensive estates of the wealthy and larger aristocracy. We also had protective import duties that stopped cheap foreign-made goods being sold on the UK market and endangering domestic manufacturing. Thatcherism brought in wide scale de-regulation and the EU forced the end of many restrictive practices and protectionism. Services now means something quite different. It includes hotels, shops, call-centres, government (both national and local). These jobs are now created by national and multi-national organisations who, in many cases, sell merchandise or services that are not created or manufactured within the UK, never mind Uttlesford. Such jobs exist within our commuting grasp by dint of a single economic opportunity reliant upon the public fads and fashions of domestic furniture, electronics and financial services. Genuine sustained wealth-creation for the future of Uttlesford may lie in the more northern silicon satellites closer to Cambridge - ‘intellectual commerce’. When you first look at a graph of male unemployment for the period 1930 - 2000, the Uttlesford curve appears to closely follow that of the national although ours is always lower. Closer examination shows that the gulf between to two lines is far greater than you might first realise. In 1930 the Uttlesford rate was 7.5 and the national rate was just over 12.5%, with the highest being 25%. This was at a time when most of the south-east was well below 10%. By 1950 the gap had narrowed considerably; Uttlesford was about 1.25%, the national average at about 2.0% with the national highest at about 8%. By 1991 we had the lowest rates in Essex for males aged 15-64 yrs who were eco-active but who were either on a government scheme or unemployed. The women of Uttlesford achieved a fairly similar success to the men. Overall we shadowed the national cycle but were far more comfortable with much smaller swings, up or down. Women became a far higher percentage of the British workforce after their invaluable contribution during WW11. In 1950 Uttlesford women were at 25% whilst the national figure was 35%. After 1950 both groups rocketed upwards. with Uttlesford overtaking in 1952. By 2000, Uttlesford women had reached over 60% with the national average lagging at 55%. Equality, in all its forms, was really reaching the workplace. Nationally, in 1931 working women rose from 34% to 58% whilst men slipped from 91% to 71%. The days of the all-controlling male breadwinner and subordinate wife were gone. So Uttlesford women were making themselves not only a greater percentage of the workforce, there were more of them and they took Uttlesford above the national figure. Uttlesford could not now enjoy such an advantageous economic position had it not been for women, wholesale, choosing to work. And that chaps, is a fact. The earliest educational record is that of Sunday School attendance in 1851 by 5-14 year olds. We and the national average both reached about 50%. Firstly let’s look at ‘choosing’ education’, those young people who choose to stay on after the legal limit. Uttlesford has always been above the national average. Following the national trend, there has been an increase from 55% in 1851 to 85% in 2001. The national picture for the same period was 53% and 75%. In 1951, of the school-leavers, we produced 10,565 unqualified and 2,088 qualified. By 2001 there were 10,992 unqualified but 38,870 qualified. The unqualified percentage in 1951 had been 85% against a national average of 75%. By 2001 Uttlesford had greatly improved, it’s ‘unqualified’ had fallen to just over 20% against a national fall to just under 30%. Although the non-graduate leavers accounted for 12,254 in 1951, rising to 38,305 in 2001, the graduate figures were much improved. 399 graduated in 1951 and this rose to 11,557 in 2001. Whatever migration into Uttlesford occurred in the second half of the twentieth century, to apparently improve by almost 30-fold is astounding. It is very difficult to get precision since government, as it is wont, keeps changing the goalposts according to what it wants to publicise. For 1951, the figures are for the percentage of pupils leaving school at/or before age 15, i.e. before the ages at which public exams are usually first taken. Then for 2001 they are simply for people without any qualifications. It is particularly important to remember that, as the figures cover the whole working population, the data do not tell us what was currently happening in schools in 1951 or 2001. The very high national rates in 1951, 86% of the workforce of England and Wales lacking qualifications other than those acquired on the job, reflect the low priority given to the education of most of the population in the first half of the century, but this was already changing. School-leavers were making marked improvements and further-education programmes encouraged late-starters. By 2001, the proportion had fallen to 29%. But, further caution since it maybe tells us something about priorities that the census lets us count the ‘unqualified’ for only two censuses but ‘graduates’ for five. However, definitions vary a good deal over time. For 1951, the data is for people who remained in education past age 20. For 1971, the data is for people with degrees or Higher National Certificates. For 1981, the definition is particularly broad, covering all with ‘degrees, professional or vocational qualifications’. In 1991 it is simply degrees. Unsurprisingly. the overall rate for England and Wales dropped from 9.7% to 7.2% between these two years. The 2001 data cover all persons with degrees, ‘NVQ levels 4 and 5; HNC; HND;’ or formal medical or teaching qualifications. In 1991 Uttlesford had the highest proportion of people ‘aged 16-24 resident in households who were full-time students’, 32.1 per cent, compared with 22.5 per cent for the county. It appears that by any measure Uttlesford surely improved not only by a considerable amount but, again, above the national average. Uttlesford comprises either 64,648 or 64,332 hectares (a hectare is equivalent to 2.471 acres) according to the methodology but the difference isn’t too important. Any measurement still gives us about 60,400 hectares of green space plus a further 1,700 of gardens; 315 of water against 280 of domestic buildings; 180 of non-domestic buildings; 750 for road,rail and path; and 670 of other. This gives a very green ratio of 33:1. The only national comparison I have is for 2001 which records Uttlesford only having .075% of its land occupied by buildings whereas the national average was 1.75%. I suspect that this otherwise innocuous little ‘green’ number is probably at the heart of Uttlesford’s magnetism. This section covers births, marriages and deaths, including changing causes of death. Unlike most of this article, it is based not on the Census but on the closely-related system for registering births, marriages and deaths, established in 1837. Data on infant mortality (the number of children dying before their first birthday as a proportion of all births) for the period 1850 - 2000 shows that both in Uttlesford and nationally, the deaths fell quite sharply from 1850 to 1875. Uttlesford had initially suffered about 115 deaths per 1,000 live births against a national figure of over 150 and both fell, respectively, to 85 and 135. Thereafter the national rate was steady until just prior to WW1 whilst Uttlesford increased slightly to about 90. Both then dived steeply to 1950 when Uttlesford was at 25 and nationally it was about 30. Thereafter the figures have declined to under 5. This is a good overall measure of the health of a population, although by the late twentieth century, rates had become so low that just one death more or less could have a big impact on a district’s relative performance. Nevertheless, the figures show that Uttlesford in the second half of the nineteenth century had better health than the national average. The fertility rate is based upon live births per thousand women aged 20 to 49. The General Fertility Rate is usually defined relative to the number of women aged 15 to 49, but in Britain the ages 20 to 49 are generally more appropriate. The data covers the period 1850 to 2000 and throughout this period, the Uttlesford and national figures are almost identical. Uttlesford started off higher in 1850 then both plummeted in 1875 and Uttlesford didn’t match the falling national figure until about 1900. Both continued the nosedive until about 1930, when they plateaued until the early 1960s when both fell again though Uttlesford fell more sharply. The effect of the Pill on an already low-fertility population from 1960 to 2000 is noticeable, both rates falling from about 75 to 50 so creating a drop of 33% . Although Uttlesford’s figure was falling faster, they met again in 2000 when the fertility rate was about 50 per thousand women aged 20- 49. Uttlesford is producing less babies but almost certainly by choice and because of the effect of an increasing over 65 population. In 1931 Uttlesford had 10,476 households which had increased to 13,218 by 1951. Thereafter the rate swiftly rose so that by 1971 there were 18,417. The subsequent rate of increase fell although the total reached 27,519 in 2001. Housing density measured by households with over and under 1 person per room also shows a great improvement with a steady decrease in relative ‘overcrowding’. This is obviously due to both a declining birth rate and to increased affluence in Uttlesford. This signals the explosion in extensions, loft conversions and the highly-prized 4th bedroom. In 1931 there was just over 1,000 households with a density of more than 1 person to a room and 9,400 with a density of less than 1 person to a room, giving a ratio of 1:9. By 2001 there were only 950 households of ‘over 1 person to a room’ whilst the’ 1 or less figure’ had stormed up to 24,866 giving a ratio of 1:136. This marks the arrival of the sometimes-dreaded DIY enthusiast although it doesn’t say how many projects subsequently fell down. The amenities data reflects a similar picture. These are deemed to be about ‘keeping up with the Joneses’. In 1951, these were piped water, a cooking stove, a kitchen sink, a ‘water closet’ meaning a flush toilet, and a ‘fixed bath’, as distinct from a tin bath hung on the wall between uses. In 1951 Uttlesford appears quite ‘primitive’ when measuring the number of households without sole use of a WC. We suffered 43% whilst nationally it was only 22%. We didn’t have lower standards of hygiene, it was the lack of sewerage systems in rural areas that made providing WCs difficult. By 1971 we’d connected to the main sewage pipelines to only having 10% against the national 15%. By 1991 almost every single Uttlesford home had its own loo while nationally it took another 10 years to approach parity. In 2001, the list of key amenities was shorter: central heating, and ’sole use of bath/shower and toilet’. Differences in what information was recorded by each census complicate comparisons over time, and none of the three measures are entirely consistent. In 1951 Uttlesford had 5,683 households with no WC: 2,238 lacking some amenity: and 5,297 had all amenities. 1971 saw the big improvement when all three figures changed to 1,961: 409: 16,047. By 2001 it had improved still further to 103:932:26,484. Referring back to the population statistics, these show almost no change from 1971 to 2001 in the number of children or 15-64 yr olds. The Over-65s were multiplying but only from 13% to 16% and they weren’t building additional rooms or buying bigger houses. If they moved house at all, it would almost certainly be to a smaller home. In 1991, 1.5 % of households in the county were living at a density of more than one person per room. This represents a decrease of 0.8 percentage points since 1981. This figure varied throughout the county from a high of 3.7% in Harlow to 1.0% in Rochford and Uttlesford. Uttlesford was demonstrating its wealth in improved property, but you do need to moderate the stats. A family of 4 constituting 1 household may have one WC. Four students sharing an identical property count as 4 ‘households’ so making the property sound overcrowded and squalid. Ok, they’re students so you could be right, but you grasp the quirks of the methodology. Uttlesford had the second highest percentage of privately-rented homes but the best areas in 2001 were not the most affluent. A bath and central heating do not really define luxurious living but areas with large-scale public housing programmes, and few ‘houses in multiple occupation’. Unfortunately, the census has never covered, apart from cars, other consumer durables, like TVs and fridges, despite their obvious importance for lifestyles. The first of only two religious censuses, the 1851 showed that ‘diversity’ wasn’t too widespread in Uttlesford. For a start it presumed that everyone was Christian and so 35 religious groups were counted and enumeration was done by counting the attendees at every church. That’s an easy way to get a 100% response isn’t it ! The results have been simplified and consequently include a very large ‘other’ category In that year 41,780 people attended church. This comprised 4,109 Baptists; 24,318 Church of England; 639 Wesleyan Methodists; and 12,710 ‘other’. Uttlesford had Church of England attendance figures of 58% against the national 50%. By contrast, Catholic attendees didn’t even make it onto the graph and their national figure was only 3.4%. Why? Persecution and discrimination as usual. The census followed too soon after the mass Irish immigration triggered by the Potato Famine of the late 1840s for many of the new arrivals to show up as church-goers on the national graph. In the eighteenth century, Catholics had been systematically persecuted. They were denied the right to inherit property. The most severe penalties were abolished in 1778, but it was only in 1829, 22 years before the 1851 census, that they were allowed to sit in Parliament, or join the army. The Wesleyan Methodists were the second largest group after the Church of England, with 2% of all attendances and 15% nationally. Not surprisingly, Calvinists didn’t feature here at all but their umbrella conglomerate of Baptists had attendance figures of 8.75% nationally and 9.8% in Uttlesford. In Henham this religious divide certainly split families in two. The second survey done in the 2001 census records 52,838 Christians; 10,474 ‘none’; 4,696 ‘not stated’; and less than 1,000 from the world’s other main religions. As UK Stats sadly admits, there is no record of the distribution of the ‘Jedi’ nor apparently of devotees of Eric Clapton or Druids. We achieved the same as the national figure of 15% for non-believers. Our percentage of declared Christians was about 78%, marginally above the national 72%. A strange result when you think how few people actually now go to church. Maybe the moment of completing a census return reminds people of a recent dramatic national event such as WW2, The Falklands, 9-11 and the London Bombings. Those events did actually swell congregations whilst they were front page news. For a fleeting breath there’s a flash of national unity that flocking to a church symbolises. Non-Christian religions hardly registered in Uttlesford in 2001. The Muslims, the largest group of the non - Christians, accounted for 0.45% against the national 3%. Hindus were 0.125% against a national figure of just over 1%. Buddhists were 0.225% with a national of 0.28%. The Jewish community in Uttlesford was 0.28%, just over half of the national of 0.50%. I’ve included this particular census since it acts as a baseline for the modern era and really highlights the improvements that have occurred, both in this area and in comparison to the county and nationally. It also follows by almost a generation, the enormous economic changes that began slowly in the 1950s but sparkled around 1970. ‘Camelot’ came in the 1970s but had really pushed its way to the top of the league tables by 1991. The 1991 Census recorded 66,128 people in Uttlesford, of whom 65,432 were residents (in 2001 this would increase to 68,940 but the rate of increase would fall). We were living in the least densely-populated part of Essex, at the rate of one person per hectare whereas the county average was 4.2% and the national was at 3.2%. Starkly contrasting was Southend, the most dense, at 38% and Harlow was at 24.8. Comparatively remote Maldon, at 1.5%, was our closest rival. Although we clearly had much more space than many in the south-east, that was just one measurement. After all, the density figures for the Scottish Highlands would be very low but that doesn’t reflect wealth. The infamous Clearances created some of the worst poverty seen in the UK. Not ignoring the old adage about ‘what’s on your driveway doesn’t necessarily reflect what’s on your dinner plate’, generally the number of cars per household are taken as evidence of material wealth. The highest proportion of households, some 44.3%, with two or more cars in Essex in 1991 was in Uttlesford. The county figure was far behind at 30.4%. You can argue that outer - London commuting areas need less cars than distant Uttlesford. Uttlesford has the lowest figure at 2.5% of households with no car when Essex had an average of 15.9%. In affirmation that our affluence isn’t temporary but continues into the ‘fourth age’, Uttlesford also had the lowest number of pensioner’s household without cars, scoring 40% against the county average of 49.2%. The ‘thrusting young executive’ is best-evidenced by the 1991 Census showing the percentage of the different age groups in any community. For example, in the ‘age group 18 - 29yrs of the resident population’, Essex had an average of 17.5% whilst Uttlesford could only manage 15.8%. The swing came with the ‘aged 30-44 group’, when Uttlesford had the highest percentage at 23.8 and the county average was 21%. This shift obviously shows that young couples can only stay in, or move into Uttlesford after their crampons are securely on that greasy pole. What does Uttlesford do for the growing family? In the category of ‘young adults aged 16-24 who are the only adult in the house but who have children aged 0-15′, Uttlesford had the lowest rate in Essex at 0.5%. Young single parents cannot survive here. Fortunately, for those children who do fledge, in the category ‘persons aged 16-24 in households who are unemployed’, Uttlesford had the lowest at 6.7% against a county figure of 9.6%. In ‘tenure & amenities’, we have the lowest figure at 1% for the percentage of households having more than one person to a room. So Uttlesford began as a series of isolated villages, was bypassed by rampant urbanisation or industrialisation, then ‘found’ by the commuter and the self-made, and vastly improved but lacking indigenous wealth-creation. The essential canvas of architectural beauty in our villages and churches has been present for some centuries and nature gave us the winding lanes and gently undulating rolling landscape. We’ve experienced a huge change in fortune in less than than half a century. Now it has been so ‘well-improved’ and ‘well-policed’ by, and for, the nouveau riche and some parish councils, that it risks being entombed in ‘nimby’ amber. There is little ‘affordable housing’ for the young who are unable to remain. We must continue to evolve for every purse otherwise we will decline or be overrun by imposed eco-development. ‘Camelot’ will become ‘Gonelot’.